It's time for a Thursday blog where I turn introspective an examine my life experience. I've written about what I eat and where it's from but not about how I eat. In the US, meals are often considered a meat-based main dish plus sides or trimmings i.e. we're having chicken for dinner. 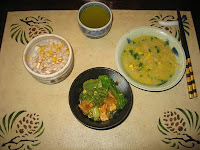 Taking a lesson from Japanese cuisine, there is no main dish to any my meals. I typically have 4-5 or five small plates that include salad, soup, rice, and vegetables. I savor every dish equally and consider them part of the palette which makes up the meal. The family gathers to discuss the events of the day, the schedule for the next day, and the challenges/frustrations we face at school/office/studio. We often read the Dave Barry calendar page of the day at dinner and comment how the day's Dilbert parallels real life. We serve ourselves individually in the kitchen, picking from a large assortment of random Japanese bowls and plates, so that every meal is a completely different visual experience, sized to the appetite of the day, the seasons, and personal whim. Grazing rather than eating, enjoying several small plates rather than a main disk, and making dinner the family time of the day works well to keep us together, keep us communicating, and keep us appreciating the wonderful myriad of foods available to vegans. Great post, John. When I was a kid, my family always ate dinner together and we talked about our day. Many years later, we are all healthy eaters who choose actual meals over grabbing something from a drive-through window or scarfing down food in front of the TV. I just read a great book called, "In Defense of Food: An Eater's Manifesto" that touched on a lot of these issues. I agree with you completely that meals are meant to be prepared, savored and enjoyed.